Intuition is that gut feeling you get about a situation or a decision. The hunch you can't quite rationalize but that just... feels right. Modern psychology generally agrees that intuition is your subconscious whispering in your ear. The idea that all the knowledge and past experiences swirling around your head are responsible for that gut feeling -- even if you can't consciously put the pieces together to understand the why. It's just one of the many mysterious ways our brains process information. 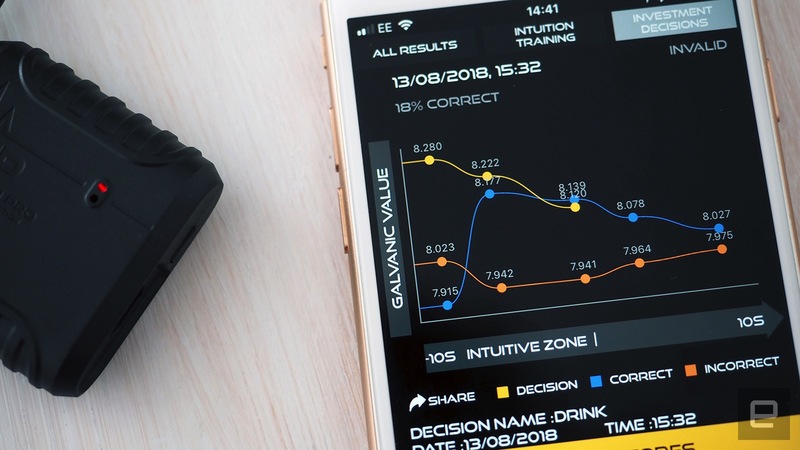 Intuition isn't something that's simple to observe, but one company claims its device can measure it, and actually enhance it. 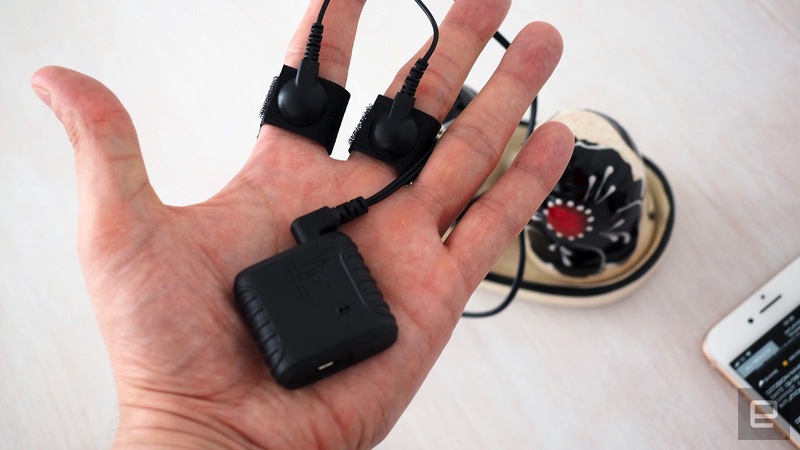 The device is called Intuition Pro, and it basically records galvanic skin response (GSR), which is changes in the electrical conductivity of your skin. 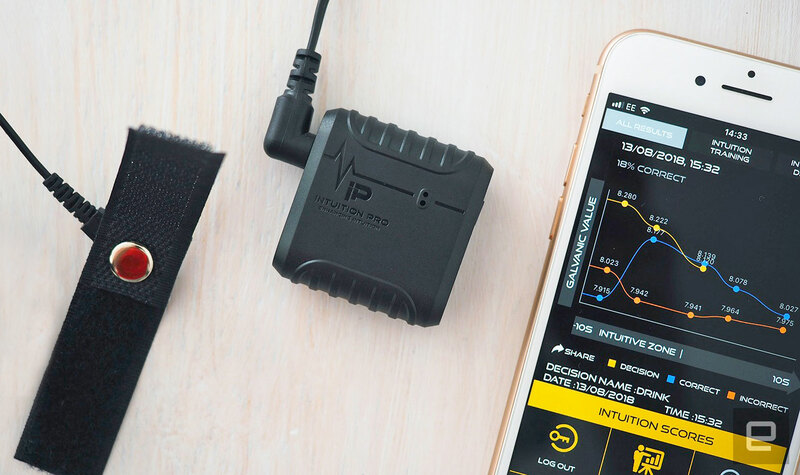 The main body of Intuition Pro is around the size of a small matchbox, and it's into this that you plug a pair of electrodes that attach to your fingers to take the measurements. It's widely accepted that GSR can show our reactions to emotions. The theory is that emotions trigger small changes in the activity of sweat glands in our skin, increasing the output of the components of sweat -- primarily water and electrolytes -- which changes how well our skin conducts electricity. GSR is like sweating profusely when you're nervous, only on a much smaller, imperceptible scale. Though there's a wealth of evidence linking GSR to emotional state, it's far from an exact science. For one, environmental factors, including temperature and humidity, can affect measurements. How hydrated someone is and where you attach the electrodes can also lead to inconsistent results. What's more, it's a simple record of skin conductivity and not of individual emotions. Fear, anxiety and sexual arousal all can manifest in GSR, but it's impossible to look at the data and make a connection to a specific emotion. 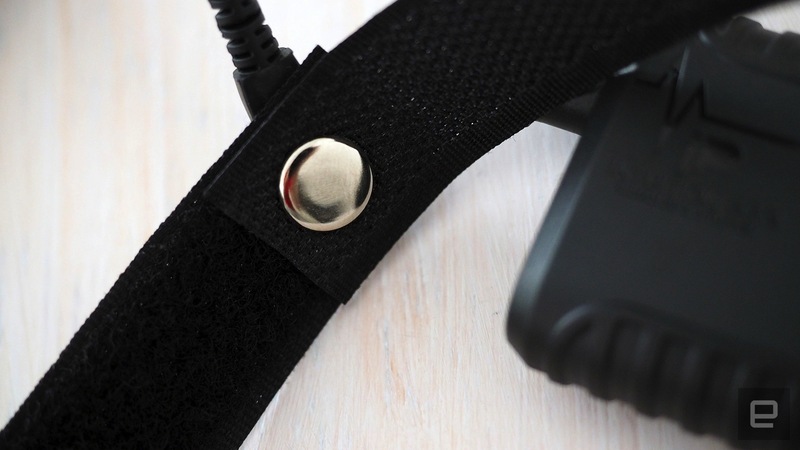 GSR is one of many measurements taken as part of a polygraph (aka lie detector) test. This is still considered more of a pseudoscience than something that can produce conclusive results, though, because there's so much interpretation involved. Case in point: Scientologists use a GSR measurement device called the E-meter during their "auditing" process. From its output, they believe they can determine mental state and stress levels. Nevertheless, GSR continues to be a point of scientific intrigue and investigation. 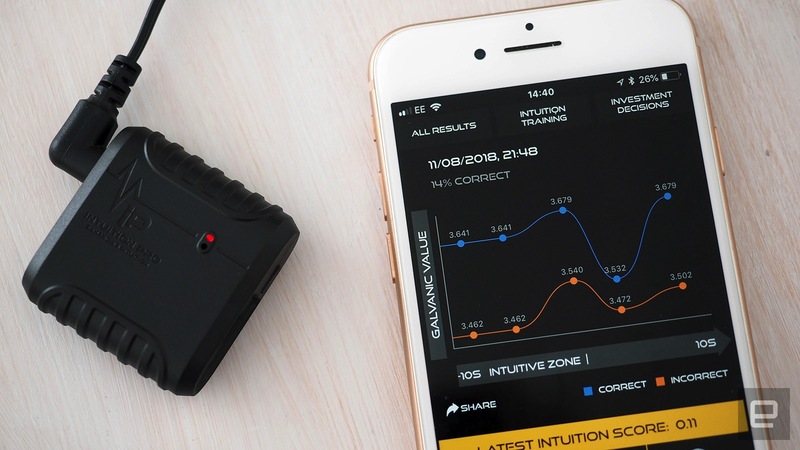 While GSR may be able to indicate emotional response, the makers of Intuition Pro take the leap of claiming that it can also be used to measure intuition. There's some research that loosely supports this. A PhD student at Indiana University conducted a study in which a group of senior nurses were pitted against nursing students in a computerized clinical scenario test. Naturally, the veteran nurses bested the students in the test, but they also showed more GSR activity during the session. "For the purpose of this study, intuitive decision making was defined as decisions that are influenced by pattern recognition based on experience as evidenced by the production of [precursory skin conductance response]." Thus, given this interpretation of skin conductivity, the results of the study suggest that intuitive decision making is measurable. The author does admit that the research used "a quasi-experimental design," however, since its conclusion is based on the assumption that a relationship exists between GSR and intuition. There's also research that suggests some people are more 'in tune' with their gut feelings than others. The University of Cambridge asked traders from a hedge fund to count their own heartbeats. Compared with a control group of students, the traders were significantly more accurate, and those who performed best were also the more experienced and accomplished traders. They deal with large, risky, short-term trades and don't have time to make well-informed calls, relying more on intuition than anything else. The study results suggest that those most aware of their physiology -- in this case, their heart rate -- had better judgment. In other words, they are more confident about their intuitive decision making. These studies form part of the sales pitch for Intuition Pro, and are specifically mentioned on its website and within YouTube videos. Exhibit A: Intuitive decision making can be measured. Exhibit B: Trusting your gut leads to better outcomes. Only Intuition Pro doesn't measure or test the traditional definition of intuition. 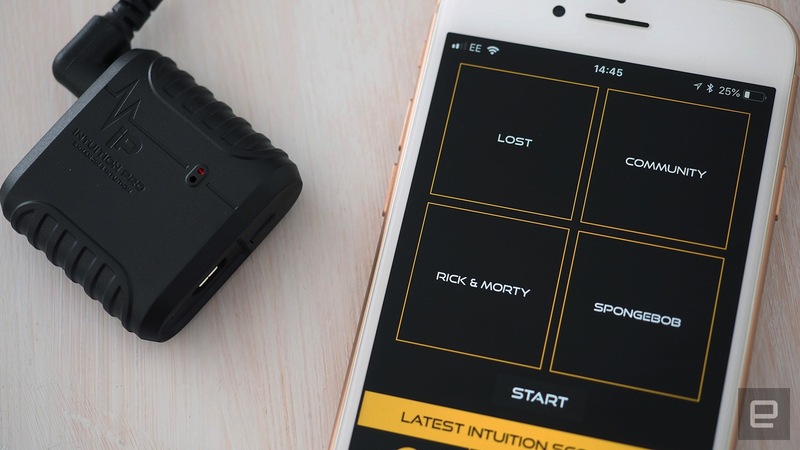 The GSR sensor provides the data, but the more important part of the puzzle is the Intuition Pro app it pairs with, which is extremely simple. For starters, you can look at live readings from the GSR sensor, which of course are of no use without interpretation. Then there are the "Intuition Training" tasks, with the categories "Stocks & Indices," "Forex & Commodities" and "Miscellaneous." 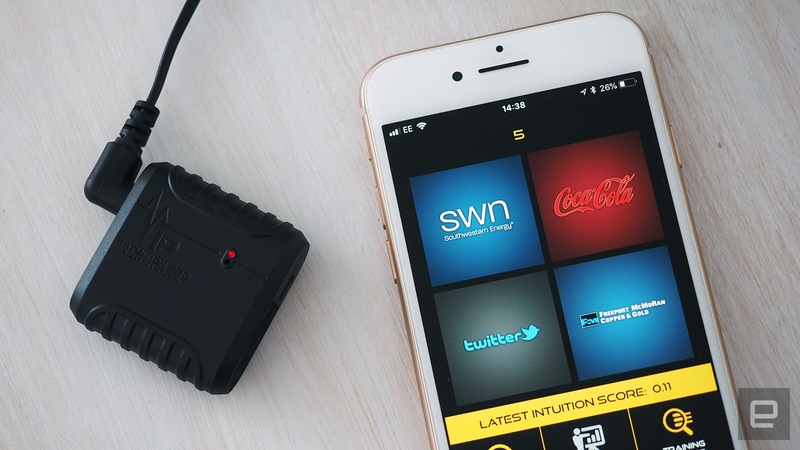 While Intuition Pro doesn't appear to be targeting one particular demographic, its makers seem to have latched on to the financial angle rather than anything more fun. Perhaps they believe it makes the product seem more serious and legitimate that way. So you select a category and the number of rounds, then you start your session. Each round, you're presented with four different options to choose from. In Stocks & Indices, that will be four different companies; in Forex & Commodities, it'll be currency trades (US dollars to euros, for example) and materials like steel and cotton; in Miscellaneous, it's a random selection of playing cards. All you do is look at these four options for ten seconds and make a guess as to which one has been randomly selected as the "right answer." It's basically the same as picking a number between one and four. 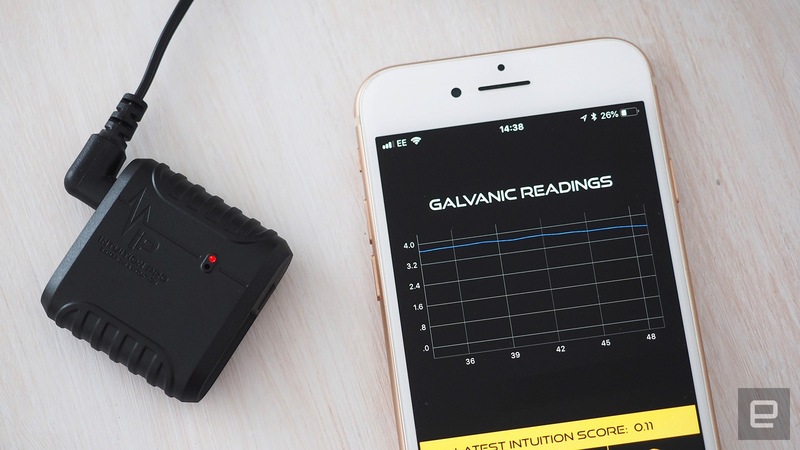 At the end of your "training," the app spits out a graph showing the "galvanic value" recorded in the ten seconds leading up to your decision and the ten seconds after the big reveal, for both correct and incorrect answers. You're left to interpret these results on your own, and I can't make much sense of them. One report shows my galvanic value being higher for correct answers before I make my decision, but higher for incorrect answers after the reveal. Another shows that my galvanic value was higher for correct answers across the board. And I'm only talking about the ones with vaguely identifiable trends. You also get a meaningless "intuition score" that isn't consistent with how many guesses you get right or wrong. I received a score of 4.3 for a round in which I made zero correct guesses, for instance, and a score of 0.17 for a round where I got only one right. Intuition Pro gives you literally no guidance with regard to interpreting your results. It just spits out data and you basically just take what you want from it. I'm skeptical about the value of this "training," to say the least, but I'm more baffled by the app's "Investment Decisions" feature, which doesn't strictly have anything to do with investments. What you do is put in four answers of your own choosing in either text or image form. For example, I created a decision about what I should drink next, be that beer, wine, rum or water -- you could also do something like put in pictures of cars you're considering buying. You then pick one of the standard training programs, run through it and confront your own question at the very end. The app doesn't pick a random "right" answer for you. Instead, that particular question has its own line on the results graph. The idea is that you look at your galvanic value for the questions you answered correctly and incorrectly and see whether the reading for your own question correlates to either of those baselines. Say I choose water and the GSR intensity for that question is similar to my correct answers. Then I guess I did want to drink water all along? But of course, I have no idea what the results would've looked like if I'd tapped a different option. And what on earth does this have to do with intuition anyway? As I've said, intuition is commonly thought to be your subconscious mind drawing from past knowledge and experience, coming together in a gut feeling you can't quite articulate. In the studies referenced earlier, the nurses drew from past experiences in the clinical scenario testing, and the traders rely on experience to make good investment calls. But picking which playing card out of four has been randomly chosen as the "correct" answer isn't reliant on any past experience or knowledge. What that task actually evaluates is your skill at predicting future events. Sometimes this is referred to as intuition, but you could also call it Spidey sense or precognition. One of the most recognized scientific terms is "predictive anticipatory activity," but the makers of Intuition Pro conflate this with the more standard definition of intuition, despite their being very different concepts. Predictive anticipatory activity (PAA) is apparently a genuine, measurable phenomenon, and studies of it have yielded some interesting results. Participants in one study were asked to look at a random selection of images, some of which were "calm" (or neutral), while others were "emotional" in nature. In the seconds leading up to the image being displayed, there was a measurable change in GSR before emotional pictures compared with calm ones. The physiological changes recorded suggest that the participants somehow knew they were about to view one of the images designed to create an emotional response. Another study measured changes in GSR and heart rate of participants gambling at a roulette table (though not with their own money). Results showed a similar, measurable response to winning before the roulette wheel stopped turning. The results of these studies and/or the experiment methodology are open to criticism, of course, as we're dealing with fringe science here. The makers of Intuition Pro highlight studies around PAA in marketing materials, which confuses the message. Is the product supposed to improve intuitive decision making or precognition? Either way, our understanding of both of these mysteries is clearly not at a point where a consumer device can measure and/or "enhance" them. Intuition Pro is a novelty at best. Despite claims that the device is rooted in science, it appears people aren't really buying into it. A pre-order crowdfunding campaign for the device failed miserably last year, scraping together just $720 toward its $20,000 target. For argument's sake, let's say it's all true and the thing really does help you hone your intuition. How could I possibly know it's working when we're dealing with such intangible concepts? My only worry is that someone might legitimately believe in the product and, after spending 89 Australian dollars on the thing (roughly US$65 sans shipping), go on to make actual life decisions based on its results. The creators have obviously thought about this too, putting a disclaimer on the Intuition Pro website that says they don't encourage gambling, nor do they bear responsibility for the outcome of personal or investment decisions driven by their device.